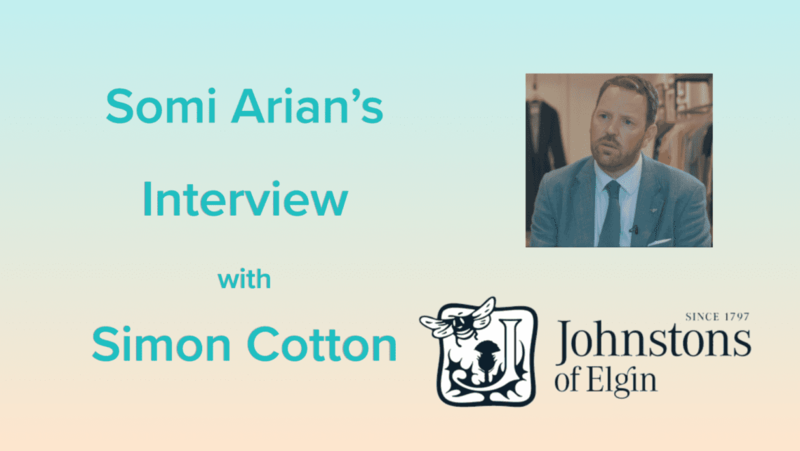 Somi Arian: One of the things that I have often observed working with and talking to some heritage brands is that I feel they may be finding more difficult to connect with millennials and to communicate the value of their heritage with a younger audience. So my intention in making the documentary is to explore how the nature of communication with millennials is different from how brands connected with their audiences, up until even a decade ago. And what we can do to connect with young people more effectively. Because in the long run, they are the ones that guarantee the continued success of any brand. Now, you are the CEO of an amazing company with over 200 years of heritage. Why don’t we start by you telling me a little about the history of Johnstons of Elgin? Simon Cotton: It started 220 years ago, so it’s an old, old story. When it originally started, it was just an ordinary textile mill. It started in 1797, and by 1846, they were starting to experiment with different fibers from all over the world. So at a time when nobody else was doing so, they worked with alpaca and llama, vicuña, which is much more expensive than cashmere. Johnstons of Elgin is employing about a thousand people now, and most of those are in the factory operations, so actually making the product. Somi Arian: Can you please tell me a little bit about the environment in which your employees work? Because one of the messages that I’m trying to get across is the quality of life that, as a heritage brand, you’re giving to your employees in the UK. As opposed to some high street brands that employ cheap labor overseas, who work in terrible environments. Simon Cotton: Well, one of the great things about Johnston is we live in these very rural communities. We’ve got a workforce who have family members who’ve been in the workforce for generations, and there’s an affection between them and the company, so it’s a genuine connection between their families and the families of the owners. And that’s gone on for 50, 70, 80 years, so it is something quite special. And I think the company feels a responsibility to its people, treats the people well. When there’s a downturn in textiles, most companies just let people go and then try and hire them again in the future, but we’ve always worked differently from that. We’ve always tried to keep our people with us and tried to look after them. And that’s not something that people have sort of discovered in the last 10 years because it’s been fashionable to be socially responsible. It’s something that’s always been there in the company. Somi Arian: So over time, has the company expanded? Simon Cotton: We’ve pretty much always expanded. There are down years and there are good years, and that just depends in fashion. You get on a trend, which is doing extremely well or a customer stocks up a lot, and then de-stocks, so all these things can happen. But, generally speaking, it’s always been going in the right direction. But we’ve never been a high volume player. Now, because so much of the mass produced textiles is no longer done in the UK, we are the largest weaving mill in Scotland but that’s really because those sort of volume players who lived in the mass market have gone and they’re no longer producing in the UK. So it’s left us looking like a big player, but that was never our intention. Our intention was always to sit at the high end and look after that part of the market. Somi Arian: So you’re mainly a B2B company? Simon Cotton: About three-quarters of our business is done B2B, so most of our business is supplying other couture and luxury brands. About a quarter is done under our own brand. The store we’re sitting in today (in New Bond Street), is one of our few five branded locations, where we sell at retail. But we also sell into wholesale, into department stores, boutiques, etc. under our own brand. Somi Arian: Okay. So everything is manufactured in Scotland. You have an authentic story. And you are a sustainable business. These are all the things that Millennials care about. Now, please tell me a little about your demographics. I do appreciate that as a luxury brand, the price point might not necessarily make it affordable to young people, but have you found that you’ve been able to connect with them and keep them interested so that they can aspire to buy from your brand in the future? Simon Cotton: Our own demographic is typically 35 to 55. So it is a little bit older than the typical millennial generation, but we are starting to get interest from that younger customer as well. An interesting thing about a lot of the products that we do is because we do a lot of accessories, we sell a lot of scarves, a lot of gloves and they are pretty ageless. So they’re not something that only an 18-year-old would wear or only a 60-year-old would wear. It’s generally the same type of product (for all ages). Somi Arian: Have your marketing activities changed over the past 20 years? Have you found that you’ve had to change your approach due to the impact technology and with the advent of Social Media? Simon Cotton: It’s changed over the last two years. So we were finding, for example, that we were relying a lot on sending people catalogues, on email broadcasts, and that had to be completely scrapped because it just wasn’t getting the response. And most of our marketing now is done via social media. And that allows us to have a very one-to-one connection with our customers. And it plays in quite well to the kind of story that we have because we tend to have customers who are very loyal to us, who are interested in the story. They’re not so much just coming in and buying one product and then going away. They tend to sort of stay with us and become part of our family, so there’s a lot of affection for the brand. Somi Arian: What is your definition of marketing? What does your marketing material consist of? Simon Cotton: If you’d asked me that question three years ago, I would have said it’s mostly print-based. It was mostly marketing collateral handed over to somebody. Now I would say it’s almost entirely digital. It’s almost entirely around social media and it’s a lot of video and photography and it’s constantly changing. So, for us, it’s a huge challenge that we have to really satisfy a lot more need for material than we ever had to before. Whereas in the past, it was enough to photograph a product and then you would show a colour cut. Now you have to not only photograph that product in every single colour, but you need to do it close-up. You need to do it in different orientations. You need to be able to turn it around because you’re going to try and sell that online. You’re going to want to put that into different situations because you’re going to want that to appear on somebody’s social media feed. And that’s a different thing from trying to physically describe what it is to a wholesale customer. You’ve got to photograph it in different ways and in a lot more options, so it is really challenging. But if you can satisfy that requirement then, then there’s lots of opportunity from it. Somi Arian: It’s really interesting, what you said about the digital. But here’s the thing that, hopefully, you can take away from this conversation and think about it. I’m hoping that I will have given you value, as well. When I say how you market yourself, I don’t mean the means of it. I’m not talking about the means of communication, I mean the actual content of the content, if you know what I mean. Because that’s where I feel I can give you real value. I want to know what your content actually say and how do you story-tell? Now our content really has to cover a lot of different bases, so you might see a product, yes. But you might also see one of our employees who’s done 30 years in the mill. You might see how the product’s actually manufactured. You might see a little video behind the scenes of our photo shoot, or something on the runway, or something being set up in-store. So there’s a lot more variety. One that we can actually communicate because before we never really had the means to communicate, but also that people are actually interested in. So it does change everything we do. I would say, for us, the big challenge is always keeping that variety going, always finding a new way to express ourselves or a new angle into the brand. Somi Arian: Who comes up with the direction for the photographer, camera person, and content creator? Do you have a map and direction for the content? Simon Cotton: Sometimes we do and sometimes we don’t. Sometimes we just look at it and say, “People are going to be interested in this. They’re going to engage, emotionally, in this.” So for the first time, we’re doing content with no clear objective of selling something at the end of it. And it is quite difficult for a brand like us to get used to this idea. So when we were talking about this three years ago, our reaction to social media was all about how do we stop damage happening to the brand? How do we protect the reputation of the brand in a media that we can’t control? Now it’s really changed, but because of the requirement for content, we’ve also got to be a lot looser. So we can’t sit there having a board meeting or a senior team meeting and discuss is this right for the brand or is this not because the media has to be fed every single day and several times a day. So it does mean that we’ve got to continually be pushing that content out. We’ve got to be a lot looser with our team and say, “Okay. Well, have some fun with this. Do something which is a little bit different.” Because, otherwise, you get something which is very, very stale and very boring. And you can put that out every single day and people just turn off. Somi Arian: Yeah. You pointed out just something really cool there. It’s really interesting how you’ve changed your attitude over the past two years, but, also, the fact that you said sometimes you do have that direction. Sometimes you don’t. It’s just about trying to find out, isn’t it? You need to be brave to experiment with it. Simon Cotton: Yes and it is mixed. There are certain things that, obviously, we’ll try and control more than others. So if we are doing a lifestyle shoot, we’ll take a lot of attention to that. But you also have to be able to walk through the mill, and see something that looks interesting, and photograph it or video it, and put it online within a couple of minutes. And that’s also very valid, but then you have to be comfortable that this is being shot on somebody’s iPhone. This isn’t shot with a film crew and 20 people sitting there for a week. This is a very different thing, and you have to be comfortable with that. I think it does take a while to feel happy that, actually, in these cases, content is sometimes more important than production value. Somi Arian: Very important point there. There are different platforms for different content. If you want to do something on the iPhone, you can use Snapchat or the “stories” feature of Instagram and Facebook. You don’t put them out on your main Instagram feed. There’s always room for things that you capture as they happen. But on the whole, it is important that your content stays on brand. A – Does it teach people something they didn’t know? B- Does it entertain them? If your content educates and/or entertains, that’s when it becomes shareable and likeable. So anything that has a feel of advertising, people switch off. You’ve got to give them information and knowledge or at least entertain them. Personally, I think one of the most important things that brands can do is “How To” videos. Whether it’s choosing the right product for the right occasion or maintenance and aftercare. It is a simple idea that can lead to generating tons of content that give people value. For example, I recently did a 12 episode series for David Duggan, a luxury watch dealer in Burlington Arcade. In the series, he talks about the differences between various watch brands and what to do when you want to buy or sell your first watch. So he’s educating people, and this is a 60-year-old gentleman, who is now creating the type of content that you’d expect to find on YouTube. Of course, he is keeping that higher-end quality, as he talked Patek Philippe and Rolex, etc… At the same time, he comes across as someone who is warm, approachable and trustworthy, because at no point does he try to be sales(y). He is giving people his knowledge, without asking for anything back. Now if you were in the market for buying a watch and you did a Google/YouTube search, who would you rather buy from? Simon Cotton: It’s about staying present in people’s mind. Even if they can’t afford to buy from you, yet! We can see some of the larger luxury brands spending a lot of money connecting with people through new music, through a lot of things, which are potentially targeting a consumer who is younger than the typical person who can afford their product. And, for us, there is a continual connection there. We speak a lot to people in the design community, students at design colleges, trying to let them understand our brand because that’s part of our future as well. And the good thing is they’re increasingly coming out of university, coming out of college, very interested in the idea of manufacturing in the UK. Twenty years ago, they’d have been looking to come out and sell for a brand that’s sourced in Asia…! Somi Arian: Millennials are used to getting value on social channels, through entertainment and by learning things. More than 50% of them no longer watch scheduled TV. They get almost all of their entertainment fix online. So if you manage to get on those platform and give them value, you will win. Simon Cotton: There is so much clutter out there. It’s hard for people to know what to believe, what’s true, what’s authentic. And I think heritage brands have something to say there, but they’ve got to cut through all this noise. And that is really, really hard to do. Somi Arian: In 20, 30 years time, do you think there might be a danger of some of these amazing brands becoming going out of business? That would be a sad day. Simon Cotton: I think it’s a challenge. And it’s a challenge partly because although these may be very well-known names, they’re generally quite small companies, and actually to connect in this way, you have to generate a lot of content. You have to be quite brave about what you do, and it requires time and effort, and people think that marketing through social media or marketing through electronic means is cheap. It’s not! Because you’ve got to spend a lot of time on it, so you might not be spending an awful lot of money cutting down trees and making catalogues, but you’re spending time and effort and investing in the brand. If you can’t do that or you don’t do that, the danger is you fall behind, and you lose out that space in people’s incredibly cluttered minds, where they’ve got all these brands competing for attention, that you don’t have a relevance because there is only so much. And now a consumer has access to brands from right across the globe. Previously, they had access to the brands who were in their own street. Now they’ve got so much choice and something has to give. Unfortunately, it’d be those brands who don’t find a way to connect with them. Somi Arian: Yes indeed! Actually, creating content for social media could be made much more cost effective with proper planning and pre-production. But it takes much more effort. It’s just different. Ten years ago you would create an advert and you’d publish it in several magazines and newspaper or you’d create a TV advert and publish it on all the channels. But now you need a different type of content for different channels. Simon Cotton: It’s about putting in the effort. Somi Arian: Yes and also it requires the brands to keep on top of it and observe the trends. And even something like the disappearing stories with Snapchat and Instagram, the things that you could do on your phone, that was not there a few years ago. We need to try and not be too attached to the means of communication and constantly be prepared to change the means and be flexible. Simon Cotton: It’s difficult. We did a launch in Berlin in January, with Andreas Murkudis, which has a very prestigious store in Berlin. They came to us and said, “Instagram live is just starting today, and we wanted you to do an Instagram Live broadcast.” So at that moment, we were walking along, live broadcasting to 200 people around the world. Now that, again, is something that you wouldn’t have felt comfortable to do a couple of years ago because you’d go, “Well, we need to edit it. We need to control what’s out there.” But, actually, we don’t have any control in that environment. If you say something wrong, then it’s gone. So the only way to really do that is to be speaking from the truth. You don’t have time to dress it up and to make a story up. Somi Arian: But that’s what makes it so powerful because people like that and they want to see that authentic side of you. It’s just important to differentiate, that type of content with your branded content. Sometimes, people confuse authenticity with quality. For a luxury brand, it’s important to stay on brand, where it matters. But there is also a time and a place for live broadcast on the iPhone. Simon Cotton: The positive part of heritage brands is a lot of them have the authenticity behind them. They’ve certainly got the history. A lot of them have very good stories to tell. The negative part is they can be very nervous to tell them because they’re used to having a lot of control. It becomes quite rigid, “This is how we portray ourselves to the world. This is the window through which we want people to see us, and we don’t want anything else to happen.” It becomes quite uncomfortable when all these different ways of accessing the brands, all this discussion takes place. I remember sitting in boardrooms 10 years ago, where the whole discussion was, “Oh, my God, what a danger we have that this social media is happening because now people can post things online about our brand. And wouldn’t it be terrible if they said something bad about us?” And the whole conversation was how do we control that? Now, you wouldn’t have that conversation nowadays. It would be all to do with how do we create a positive buzz on social media about our brand, so it’s changed very, very quickly. I hope you have enjoyed this in depth interview and gained value from it. 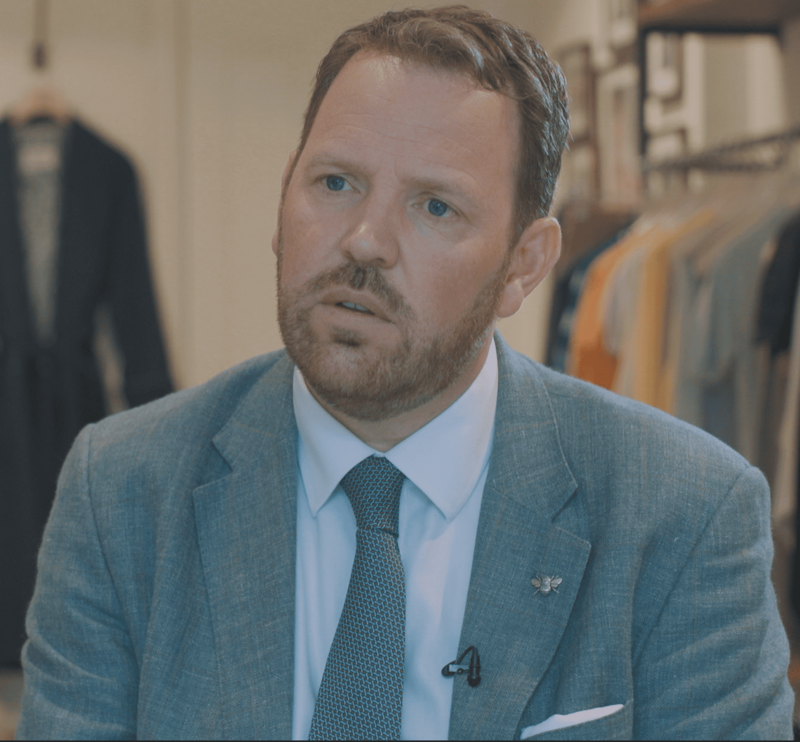 Check back here next week for my interview with Simon Cundey, Owner and Managing Director of Henry Poole at Savile Row.